Chefs Skull-Rare, Hard To Find Last One! 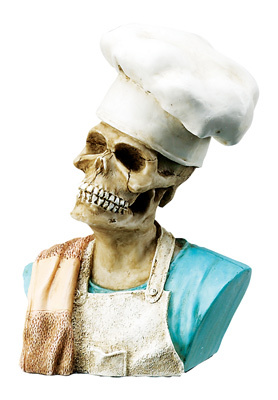 Now here's a skull every chef wants in their kitchen. He's only 4 inches tall, but he's a prize catch. Hand painted and made of cold cast resin. He's been discontinued by the manufacturer, but we still have a few left. Grab him now because he won't last!